I'm really excited to tell you about a project I have been working on for a few weeks. I will be selling custom iPhone cases in my new shop, Uber Chic Studio. I have a few designs ready to go, and a few really exciting ones in the works. If you are in the market for a new case, have a look around! My favorite part is the colors and text will be completely customizable and the cases will be manufactured on an individual basis. If you are interested in one of our designs for a device not listed, please let me know. We would be happy to design a case for your Samsung Galaxy S3, Kindle Fire, Apple iPad, iPhone 3, iPhone 4, iPhone 4s, iPhone 5 or iPod Touch 4G. And because I love you all so much, enter UBERCHIC10 at checkout to receive a 10% discount. These are so CUTE! I love those tiny dotted ones the best. I LOVE the polka dot case with the single heart, however I have a Galaxy S3. Are you thinking about making cases for other types of phones? Yes! Because each case is manufactured one at a time, we are able to make cases for several devices. We would be happy to design a case for your Samsung Galaxy S3, Samsung Galaxy Note S2, Kindle Fire, Apple iPad, iPhone 3, iPhone 4, iPhone 4s, iPhone 5 or iPod Touch 4G. Ah perfect! Thank you so much! I love #6. The dots, yellow frame & font are just adorable together. But also #1 is amazing? I love the simplicity. Hmm... this is going to be a tough choice. So proud of you, friend! I love these designs! What material are they made out of? I was excited to see that you had cases for phones pictures than the iPhone. I haven't found very many options for my Samsung Galaxy S3. They are molded plastic. The designs are heat set, so they won't rub off or fade. Congrats Madeline, that's awesome! Love your designs. THIS IS ADORABLE. I am so excited for you! SOOOO cute. Obsessed with #4 Navy Dots & Heart. What talent you have, Madeline! too expensive for my taste. but they're cute. i'd recommend lowering your prices. but that's just me. I can understand that. The thing is, that they are a custom product & the manufacturing process is pricey. My profit margin is actually really small. 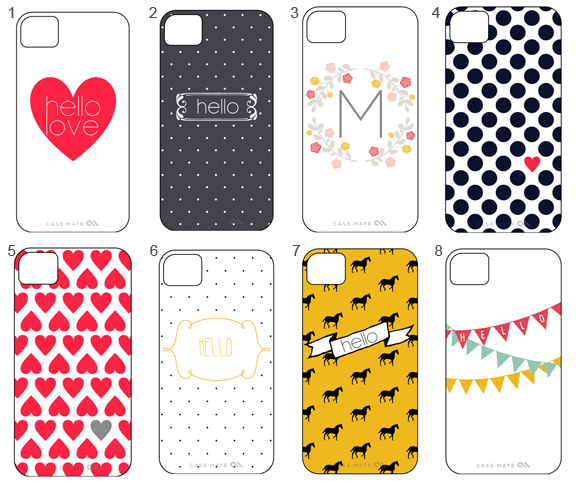 There are a lot of premadr cases from UO or F21 that would probably meet your needs better. Question if I got case #3 could I keep everything the same ( except initial) but change the background from white to Emerald? If so I am totally in. LOVE LOVE LOVE. You have to pay about 40-50 for a good iphone case anyways why not get it customized! You're a genius!